Nitrogen fixing plants are a natural and sustainable way to add nitrogen to gardens, landscapes, and ecosystems, excellent for organic gardening. Here I write about the remarkable phenomenon of nitrogen fixing plants, and explain how you can benefit from them in gardening and landscaping. Nitrogen fixers are an important part of natural ecosystems, and an integral component of my recommend best practices for sustainable landscaping. Nitrogen fixers are plants that have the ability to take atmospheric nitrogen and convert it into forms usable by plants and animals. Here I will show you how you can use these plants to fertilize your garden in a natural and organic way (free of synthetic chemicals), enriching your soil without the need for applying fertilizers. Why is nitrogen important? And why is it in such short supply in some ecosystems? Nitrogen is one of the key elements in all life forms on Earth; it is part of protein and many other biological molecules. Nitrogen is the limiting factor in many ecosystems, which is why agriculture and gardening often requires some use of nitrogen-rich fertilizers. Some of you may know that nitrogen is the most abundant gas in the Earth's atmosphere. If it is so abundant, why is it in short supply? The answer lies in the fact that it is hard to break apart nitrogen gas molecules to get the nitrogen into a biologically useful form. Nitrogen fixers, which include bacteria, and certain plants that contain these bacteria in their roots, are the only life forms able to extract nitrogen from the air and convert it to a form useful for life. Nitrogen fixing plants working with these bacteria are an example of symbiosis, two different species that work together to benefit both of them. Do you think much about organic gardening? Do you think about reducing the use of chemicals and fertilizers when you garden? Yes, I think about organics a lot. Sometimes; I think about these issues somewhat. Not really; I haven't thought about this much before. You can get most of the benefits from these plants just by planting them. You don't need to do much to benefit from having nitrogen fixers in your yard and garden. Nitrogen-fixing plants tend to bleed nitrogen through their root systems, so they will often benefit plants that grow near them. Whenever you have nitrogen-fixing plants, collect and leave the plant material on your garden, flower-beds, or add it to your compost. This material includes any part of the plant, and especially the leaves, stems, and twigs, as these make up the bulk of most plants. Nitrogen-fixing trees like locusts will drop a great deal of leaf litter in the fall--make sure to leave these leaves on your garden or flower beds. They will break down much faster than larger, tougher leaves, and they will enrich the soil for future growing seasons. Some people already have nitrogen-rich soils in their yard, such as people who live in areas with extremely fertile soil, or people who practice backyard composting. These gardeners often have little need to for nitrogen fixing plants, as sunlight or water are often more of limiting inputs into plant productivity. Have you ever gardened with nitrogen fixers? No. I garden, but have not tried using nitrogen-fixing plants. Keep that clover in your lawn! Clover is a natural and free way to add nitrogen to your lawn. Many people treat their lawns with chemicals to remove plants they consider "weeds". One of these common "weeds" is clover, along with a variety of other similar plants. I think this is a shame, because clover is a legume and a nitrogen fixer. You also might increase your luck if you find a four-leaf clover! Clover in lawns exists in a natural balance. It tends to thrive in areas that are lower in nitrogen. If the nitrogen level increases beyond a certain point, the clover will be out-competed by grass and other plants that have higher nitrogen needs. Do not apply herbicides - Most selective herbicides used on lawns will quickly kill clover and other legumes. Leave grass clippings on the lawn - Clover leaves and all plant parts are very nitrogen rich; if you collect them, you are taking nitrogen out of the system. Instead, leave the clippings on the lawn, and the nutrients will go back into the soil, ensuring your lawn will stay lush and green. Be cautious about applying nitrogen-rich fertilizer - Clover thrives in relatively low nitrogen levels; if you add too much nitrogen, your grass may look green temporarily, but you will kill off the clover, and you may be contributing to nutrient pollution when the nitrogen fertilizer runs off into streams and the water table. Once established, a healthy lawn does not ever require fertilization. Do you like clover in lawns? The bean family, Fabaceae, contains a wide range of plants, including beans and peas, as well as numerous trees, shrubs, and wildflowers. Beans, peas, peanuts, locust trees, acacia, and much more! Most nitrogen fixers are legumes, a family of plants that includes most plants we call beans and peas, peanuts, clover, as well as a number of trees, such as locust, acacia, and many others. The legume family also includes numerous flowers and ornamental plants. Legume flowers tend to be quite showy, coming in a wide range of colors, including yellow, white, pink, purple, and blue. Whether you are looking to grow food plants, ornamental flowers, or a large tree, there are numerous nitrogen-fixing legumes to choose from. You can plant these plants together with other plants with high nutrient needs, just like how farmers rotate crops of legumes like soybean or alfalfa, with corn. Legumes are not the only nitrogen fixers! Here are two examples of plants in other families which also have the ability to fix nitrogen. Plants other than legumes capable of fixing nitrogen. Although most of the nitrogen fixing plants are legumes, there are a few other examples. Pictured above on the left is Sweetfern, a plant native to eastern North America. The closely related Bayberry can also fix nitrogen. These plants, native to sandy areas and beaches on the east coast of the U.S., have the added benefit of attracting Yellow-rumped warblers in winter. Alders, which include both trees and shrubs, also are able to fix nitrogen. Alders are often found at northern latitudes and higher elevations. Top right is a grey alder, a species distributed widely across the northern hemisphere in Europe and North America. The remaining non-leguminous nitrogen fixers are esoteric, scattered through a handful of other plant families, and include a few types of Coriaria, Chamaebatia foliolosa, and a few others. These plants all have a similar symbotic relationship with nitrogen-fixing bacteria in their roots, just like legumes, although these plants are associated with different bacteria species from the ones symbiotic with legumes. Although an overwhelming of legumes are nitrogen fixers, there are a few examples of plants that are not. Eastern redbud (above, left), a small tree native to Eastern North America, is a legume, with characteristic pea-like pods, but is not a nitrogen fixer. Another example is the Kentucky coffeetree (above, right), a large tree whose seeds were historically roasted to produce a (caffeine-free) coffee substitute. These plants naturally grow in nutrient-rich environments, so they have no need to fix nitrogen. Although they are descended from a common lineage with other legumes, somewhere along the line, they lost this ability! Keep this in mind if you plant them--both are beautiful landscape plants in their native range, and grow well under the right conditions, but both require relatively rich soils and will not do much for adding nitrogen to the soil. How much did you learn from this page? A lot! This was all new to me. Some. I knew some, but also learned some new things. Not much; I knew nearly all of this stuff already! How to identify and distinguish the wood poppy native to eastern North America, from the invasive lesser celandine, a similar plant native to Europe. Shade tolerant asters, which grow, thrive, and bloom in part shade to full shade, in Eastern North America. Honewort, or Cryptotaenia canadensis, is a perennial native to Eastern north America which is easy to grow and can be used as an herb, vegetable, and spice. Composting cuttings and any yard waste is also a good idea. And tining is a good idea if you have compacted soil that needs aeration! I also don't use any synthetic fertilizer. I do drink a lot of tea, though, and I compost the leaves. In some past gardens, I've created a full-on compost heap, which has been awesome. There are also some very showy legume flowers too, like lupines, false indigo, and many others. I don't use chemicals anywhere in my yard or garden, and I knew that peas and beans were good to use as compost. Occasionally I have clover plants and now I will know that they are useful as well as attractive. I have not much grass, but the cuttings from mowing the allotment verges is sent to my compost heap. mixed with more woody material it provides a good nutrient source.Another idea for your ground is tining. This involves spiking the soil with a fork so that air and therefore oxygen and nitrogen can enter the higher levels. 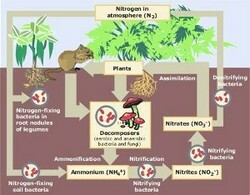 The oxygen feeds the roots and the nitrogen feeds the nitrogen-producing bacteria.